The Genealogy Magazine of New Jersey has been published by the Genealogical Society of New Jersey since 1925. The September 1997 edition contained an interesting article, Essex County Gravestones— Some Tombstone Inscriptions with Irish Places of Birth in Roman Catholic Cemeteries. Essex county is mostly urbanized, near New York City, and in the north east of New Jersey. 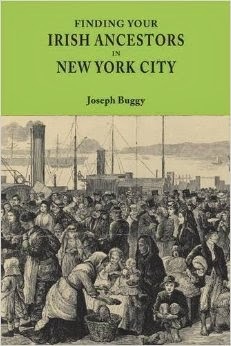 Many Irish immigrants arrived in New York and went to Newark—the biggest city in the state—and other parts of New Jersey. While this article might be of use to some readers, another article in the same publication, “John Hugg Sr. was Not an Irishman” [italics added by article author] definitely will not! A full list of their published articles can be found here and you can find details about the publication here. Rubicam, Milton. 1965. John Hugg Sr. was Not an Irishman in Genealogy Magazine of New Jersey. Vol. 40. No. 3. pp. 97-99. I just found your blog and was happy to see the post about Essex County NJ. I will have to delve into the Genealogy Society of New Jersey. I found a great Aunt who moved to Newark sometime between 1910 and 1920. This has been a mystery because all of her sisters and brother stayed in Allegheny County PA.